Quality finish needs a quality room. With the evolution of post production in our industry, the way we finishes content for the big screen has evolved. It is common for productions to purchase and drive their own offline system. In reality these systems are also capable of online finishing as well.. if only these productions could walk into a calibrated room and plug in for those last few critical decisions. The Finishing Room makes this a reality. The Finishing Room is the first Australian company to offer this capability as a service. In other words, “dry hire” the Finishing Room. The theatre consists of a 3.5 meter wide screen in a room specifically set up for critical colour decision. The Projector is the latest technology BPP Laser (Blue Pump Phosphor Laser) DCI projector. This produces better color consistency across screen and reduced variance in colour over time. We use the highly respected LightSpace CMS (Colour Management System) to ensure colour and brightness accuracy. The Finishing room is equipped to bring your production in and on to the screen from common well known workflows. 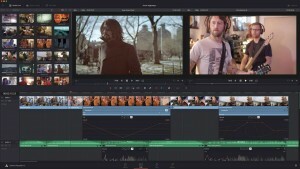 DaVinci Resolve, Premiere, Final Cut Pro. If you are not sure of your workflow, the Finishing Room can help to ensure the native P3 colour volume of Digital Cinema is fully in your grasp. There is a DCI mastering system with Resolve and Premiere located in the room for those who would like to “Wet Hire” the room. (Ie with equipment capable of doing 4K DaVinci Resolve or Premiere workflows). We also have a list of recommended operators for grading and editing if you require them. We believe that the only way to master for cinema is in the same location as the grade, as it is only then that you can be completely confident that what you see on the screen used for creative intent, is identical to the DCP being distributed around the world. The Finishing Room has been specifically set up for this purpose utilising the latest in Dolby DCI playback equipment as used on over 45% of the world’s Cinemas. The finishing room is equipped with 5.1 and 7.1 sound utilising cinema grade sound processors and amplifiers. We also utilise a HI/VI (Hearing Impaired/Vision Impaired) system, OCAP and CCAP (Open Captions/Subtitles and Closed Captions). A full quality check (QC) of all the features of a DCP can be checked and verified with real in the field equipment. The finishing room is also equipt with DCI equipment from 3 well known brand DCI manufacturers. DCPs are checked against these players to make sure no edge case incompatibility could interfere with content distribution resulting in “Dark Screens”. The finishing room can also facilitate distribution to cinemas located in Australian and New Zealand with or without KDM (Key Delivery Message for Secure encrypted playback). The Finishing Room’s past experience with the installation and maintenance of many independent cinema locations gives it valuable experience in mitigating all risk when going to screen.